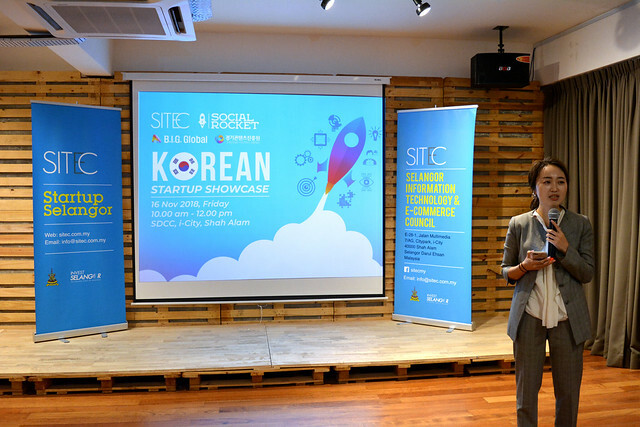 On 16 November 2018, SITEC co-hosted the Korean Startup Showcase with B.I.G Global and Gyeonggi Contents Agency, to bring 8 of Korea’s coolest startups to pitch for a prize pool of USD 20,000. The startups of various stages competed to be one of the four winning startups that would get USD 5,000 each, and were witnessed by three judges and an audience of around 30, comprising entrepreneurs, investors, and potential business partners. Some competitors were involved in various deep and high tech industries such as AI, blockchain and AR, whereas others were in e-commerce and health tech. Prior to landing at SITEC, the teams had pitched at BANSEA, Singapore; and Sunway iLabs, Malaysia, earlier in the week. The tech startups were in Singapore and Malaysia to explore opportunities to expand and look for local business or collaboration opportunities. SITEC fielded two judges, Ann Lee, Startup Manager; and Yong Kai Ping, Chief Executive of SITEC. The third judge was Muhammad Shafiq Mohd Khairuddin, Growth Ecosystem Development, Malaysia Digital Economy Corporation (MDEC). Winners went home with a cash prize of USD 5,000 each, sponsored by sponsored by Gyeonggi Contents Agency. For more photos, check out our photo album below!